Roseville, CA – An eager crowd started to form around the official scoreboard of the 4th Annual Capital Cup on Sunday, as the River City Rebels and Sactown Sticks were neck-and-neck in the final hours of their three-day golf competition. It was either team’s game to lose, a fact that was all too clear as the golfers’ teammates and other spectators watched from the balcony of the Granite Bay Golf Club. The stakes were high: the victorious team would win $50,000 for their favorite local charities and non-profits, many of which were among the spectators, cheering along the business executive who graciously fundraised on their behalf over the last three months. The Capital Cup is a Ryder Cup-style golf tournament comprised of 28 Sacramento-area business executives. Its mission is to promote community pride and healthy competition, while raising money for charities active within our region. Each executive selects a charity with a mission close to their heart and fundraises on its behalf over three months. Then the 28 executives, split into two teams (a la Ryder Cup), compete for the $50,000 grand prize in a tournament that takes place on three of the most beautiful, prestigious, and challenging courses the Sacramento area has to offer, including Serrano Country Club, Del Paso Country Club, and Granite Bay Golf Club. This year the fundraisers brought in over $1.4 million for 22 charities, the breadth and depth of which is only matched by the Big Day of Giving. The wide range of charities benefited by the Capital Cup is the basis of its foundation. 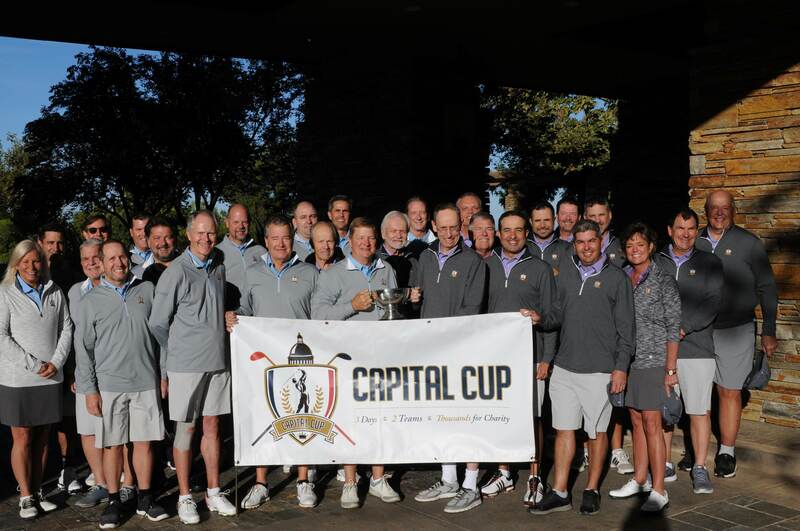 “There are so many worthwhile charities out there and none of us has the capacity or means to support them all,” said Curt Rocca, Managing Partner of DCA Partners and founder of the Capital Cup. “This format allows us to band together and impact a wide range of great causes, all of which are doing wonderful things to benefit those in need within our community.” Since its founding four years ago, the Capital Cup has raised over $3.6 million for 40 different charities. “Our donors appreciate that 100 percent of their contribution goes to the charities,” said Bob Clark, President of Operations at Clark Pacific and team captain of the Sactown Sticks. “The golfers pay $2,500 just for the honor of being in the tournament. Those player fees and sponsorships pay for the back-end expenses, so that every penny of the $1.4 million raised will go to the selected charities.” The Capital Cup tournament would not have been possible without the generous support of its sponsors: DCA Partners, Moss Adams, River City Bank, Direct Technology, ConnectPoint Search Group, Buzz Oates, Clark Pacific, HaneyBiz, and Bouchard Communications Group. The 4th tournament was a year of new records: not only in fundraising—in addition to the unprecedented $1.4 million earned for charity, six executives each raised over $100,000 for their charity—in the game’s final minutes, the score between the two teams had never been closer. It came down to the final roll of the last few putts, and finally, the score was posted: 15 points to the River City Rebels, 13 points to the Sactown Sticks. The tournament planning committee is looking for sponsors for its 5th Annual Capital Cup in 2019. For information on how you can make an impact in the Sacramento community while promoting your brand, please contact Amanda Schroeder at aschroeder@dcapartners.com. Based in Sacramento, DCA is the Central Valley’s leading Investment Banking and Private Equity firm. DCA’s mission is to maximize the prosperity and success of closely held businesses and their owners, while enhancing the vibrancy of the communities in which they do business. The Capital Cup is a hallmark of how they strive to do this. On the Investment Banking side, DCA helps family-owned and other closely held businesses grow through acquisition (buy-side advisory), or maximize the value they receive in a sale of the business (sell-side advisory). Similarly, the Private Equity Investment arm invests in growing family-owned and other closely held businesses in a broad spectrum of industries. DCA can provide investment capital with very flexible structures for a variety of purposes, including growth capital, acquisition financing, and complete company buyouts.